Adcock Ingram is a leading JSE-listed South African pharmaceutical company that manufactures and markets healthcare products to both the private and public sectors. Allergex, is a well-established brand that forms part of the Adcock Ingram stable. The brand specifically provides a cost-effective and broad-spectrum range of allergy solutions (antihistamines), that are suited for the whole family. Allergex (schedule 2) offers a market-leading range of antihistamine products that comprise first generation molecules. The local antihistamine market is however flooded with a variety of solutions and the current trend is for doctors and pharmacists to recommend newer generation antihistamines, due its increased efficacy and decreased side effects. In 2018, the Allergex team set out to design a campaign to maintain market share and retain customer loyalty, while growing mass awareness about Allergex Non-Drowsy (schedule 1), its newest range of antihistamine products that contains second generation molecules. Essentially, the overall objective was two-tiered. Firstly, to get consumers to specifically ask for Allergex. And secondly, to encourage healthcare practitioners (HCPs) who wish to recommend alternative antihistamines, to still opt for a product from the Allergex range, and not from a competing company. There are a league of legal restrictions that prohibit pharmaceutical companies from promoting schedule 2 and higher products. To this end, the team decided to leverage its new generation schedule 1 range, Allergex Non-Drowsy, to protect the core brand and retain and grow the market share of the entire range. 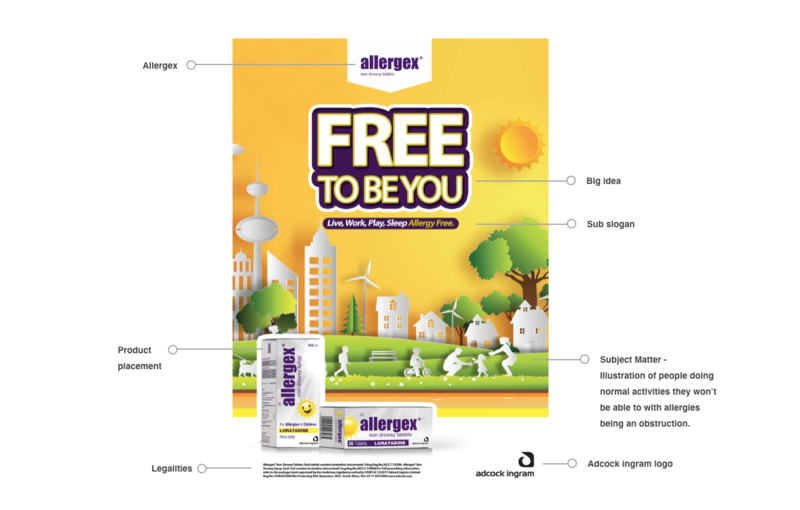 BWD Advertising (BWD) conceptualised a new slogan ‘Free To Be You’ for Allergex Non-Drowsy and developed a new look and feel that supports this new message. The rationale for this direction, was to shift the focus from the clinical aspects of allergies, to the emotional side of it that speaks to how it affects people’s lives, daily. The Allergex team’s internal market survey confirmed that this messaging has the potential to deeply resonate with consumers, as the aspect about allergies that affect them the most, is the impact it has on their quality of life. And ‘Free To Be You,’ indeed reinforces that Allergy Non-Drowsy reduces the effects of allergies and supports you to live your life with as little as possible restrictions. Upon approval of the new concept, and to ensure optimal impact and reach, the BWD team commenced with promoting it aggressively on Allergex’s Facebook page ‘Live Allergy Free’ that can be found at: https://web.facebook.com/BeAllergyFree/. Before commencing with R&D of the content, the entire team attended a series of medical compliance training sessions. The approach that the team follows on Facebook, is to develop monthly themes, in which one particular allergy-related topic is discussed at length. The general consensus amongst marketing specialists is that top-of-mind status can only be achieved by repeating a message consistently and regularly. In addition, discussing one topic comprehensively, helps to make sure that target audiences are educated and informed properly. To ensure maximum engagement, useful and interesting allergy-related factoids are shared in a user-friendly manner and a warm, personable tone, with strong calls-to-action. This is supported by weekly competitions which enable audiences to win lifestyle and wellness kind of prizes. Where relevant, and where it can contribute to consumers gaining more insights into the treatment of their allergies, the team also develops more comprehensive blog articles that are uploaded on a dedicated microsite which can be found at: www.liveallergyfree.co.za. Extracts from these articles are then posted on Facebook, with links to the full articles. The team furthermore pays Facebook to increase page likes and grow the Live Allergy Free online community. The reason for this, is that it is proven that paid-for advertising yields exponential growth, that one simply cannot achieve organically. Ensuring consistency at all touchpoints, is key to compound any of the campaign efforts and to ensure integration of all communication channels, across the board. Images of the revised packaging can be viewed here (Click here) and creatives of the billboard ads for example, can be viewed here (Click here). As awareness about a product increases, consumers will naturally start searching for it online. The BWD team conducted an audit of Allergex’s Google ranking, and found that the brand was not ranking sufficiently. A number of interventions were then proposed to improve it, which i.e. encompasses backend search optimisation efforts, inserting highly searched phrases in all online content and the publishing of a series of editorial articles on key media platforms. BWD also paid for Google advertising, to improve Allergex’s ranking instantly, whilst building the capacity for organic ranking over time. In the first quarter that BWD has been working on the Allergex Non-Drowsy account, from 1 September to 31 December 2018, the Live Allergy Free Facebook page has gained 6541 new likes, which constitutes a growth of 46% over four months. The content posted on Facebook over this period reached close to 2.5 million users, with an average post reach of more than 100,000 per post, with the top locations reached being Cape Town, Johannesburg, Pretoria and Durban. Thirty competitions were run over this period, which yielded participation from more 850 people. 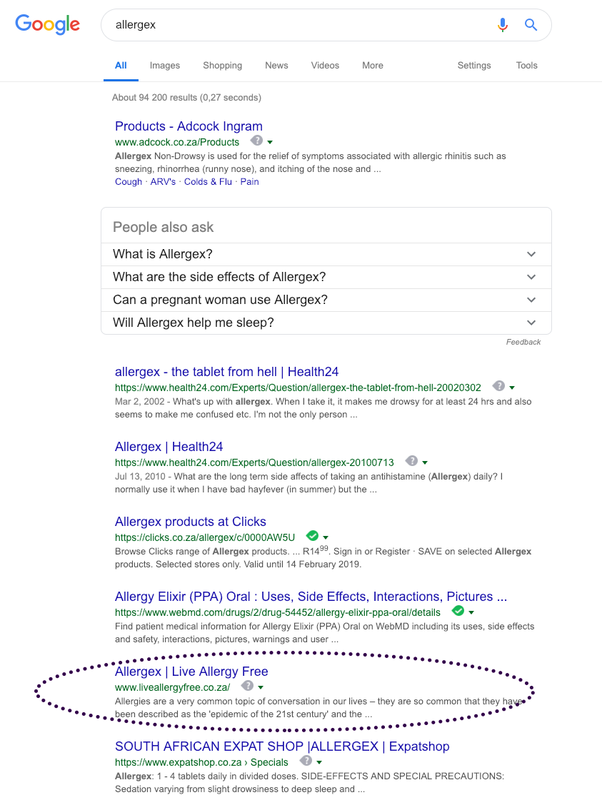 On the SEO side, Allergex now ranks on the first page of Google. The advertisement of medical or pharmacological offerings in South Africa is strictly regulated by a multitude of different laws and industry codes and regulations that could restrict pharmaceutical companies from promoting their products creatively. The BWD team quickly became au fait with this environment and how to promote pharmaceutical products within this regulatory box. For more information on promotion of pharmaceutical products, feel free to visit www.bwdadvertising.co.za, call +27 (0) 11 321 0193 or email info@bwdadvertising.co.za.